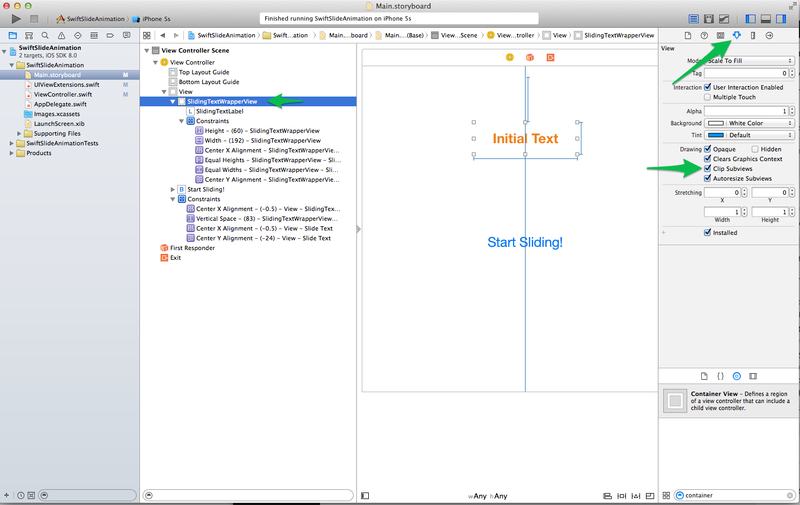 In a previous post about fade animations in Swift, I demonstrated how to use a class extension to add the ability for any UIView instance to easily call fadeIn() or fadeOut() on itself. This strategy was nice – the animations, while simple, would have cluttered my code each time I used them, had I not encapsulated them somewhere. Employing class extensions in Swift seemed a natural way to provide this functionality to UIViews. Well, I liked the idea so much that when it came time for me to implement a slide animation, I kept the same strategy, and I’d like to share my implementation with you today. The easiest way to get the gist of what I’ve done is to head over to GitHub and download the example XCode Project. In real life, I’ve combined the fade animations and the slide animation into the same UIView extension, but for education’s sake, I’ve split them out so you can easily see the moving parts. 3 – Code the View Controller – initiate slide animation. In my example, I wired the trigger up to a button’s touchUpInside action. For you, it may be something different that triggers the animation to begin. Whatever it may be, call slideInFromLeft() on your UIView instance (in my case, the UILabel). Notice that directly after the call to slideInFromLeft(), I change the label’s text property to contain the new text that I want to slide in. The real work all happens inside the UIViewExtensions.swift file where I add the slideInFromLeft() function to a UIView’s arsenal. To keep things simple, I only allow myself to customize the duration property, and optionally provide a completionDelegate when I call the function… the other properties are more fundamental to how the animation should perform, so I encapsulate the implementation here so that it’s an abstraction when I actually call slideInFromLeft() later in my View Controller. This is probably the more challenging piece, just because it takes some tweaking to get the auto layout constraints just right. My general setup in this example is a Label wrapped inside a containing UIView. I made sure to simply drag over a regular View (not a Container View) from the utilities pane on the right. I then dragged a Label inside the “wrapper” view. I set wrapper view’s width to a value that was less than the entire screen’s width. This was so that the sliding view didn’t appear to slide in from off-screen and slide out off-screen. Instead it appears to slide in from underneath the wrapper view… You’re welcome to customize this how you want (or avoid the containing view altogether if you find it’s not needed for your specific implementation). The final piece of the setup is to wire things up to the View Controller and animate the Label. @IBOutlet weak var slidingTextLabel: UILabel! 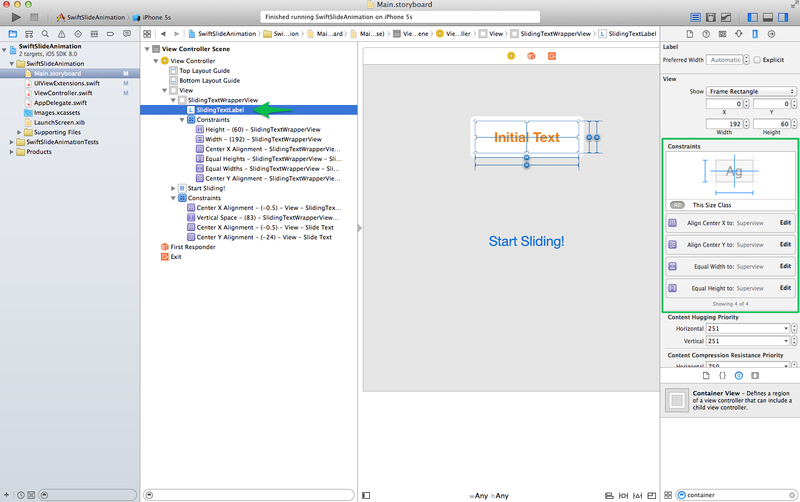 Next, I needed a way to initiate the slide in animation – I decided that wiring it to a button’s touchUpInside action would be sufficient for the example, so I created an IBAction from my Storyboard to my View Controller for that purpose. If you have need to specify a duration or a completionDelegate, there’s a commented out line of code there that shows an example of passing those arguments to the slideInFromLeft() function. That’s a wrap, folks! 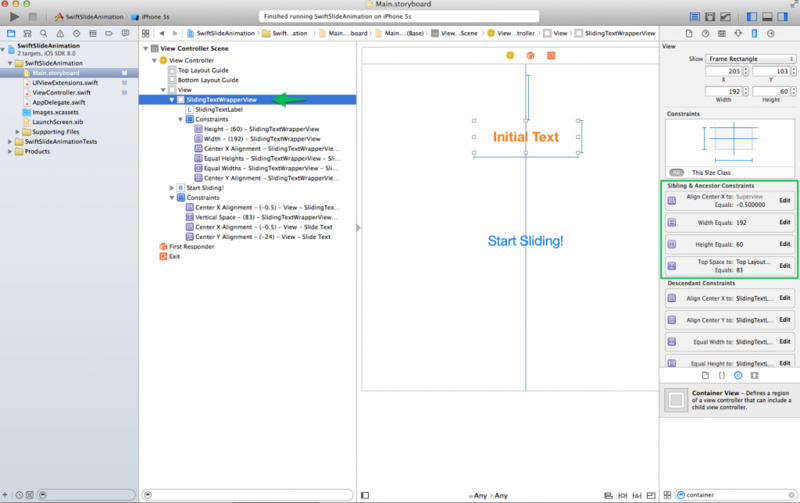 Hope this strategy is helpful for you as you think about where to place code for your UIView animations.